Vanilla ice cream and mini marshmallows give strawberry gelatin a creamy texture. 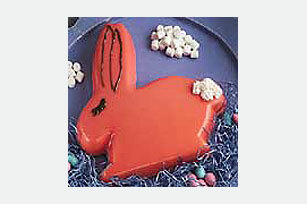 A bunny mold transforms it into the perfect springtime treat! Stir boiling water into dry gelatin in medium bowl at least 2 minutes until completely dissolved. Stir in cold water. Let stand 20 minutes to cool. Add ice cream; stir until completely melted. Stir in 1-1/2 cups of the marshmallows. (They will float to the top.) Spray 5-cup bunny mold or other shaped mold on tray; spray with cooking spray. Pour gelatin mixture into prepared mold. Refrigerate 4 hours or until firm. Unmold onto serving plate. Garnish with remaining marshmallows. Store leftover gelatin mold in refrigerator.